"Raising a child with special needs puts the family in a category all of its own … The child’s needs become a powerful organizing force within the family and at the same time create intense challenges and strong emotions affecting family life and relationships ... Colin Farrell’s work with The Foundation for Angelman Syndrome Therapeutics (FAST)reflects his deep understanding about the many challenges that families with special needs children face." 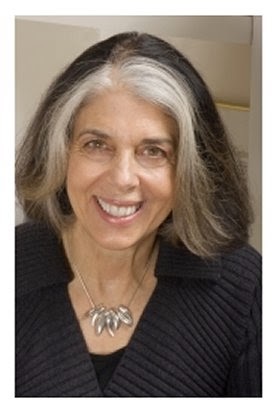 ~~ Lois Braverman, LCSW , President and CEO of the Ackerman Institute for the Family. Photo above left of Lois Braverman, President and CEO of the Ackerman Institute for the Family. Photo right pictured top L-R Colin Farrell, Natalie Morales, Jeannie Ackerman Curhan and Christopher J. Spano. Photos courtesy of Ackerman.org and James Grant PR. 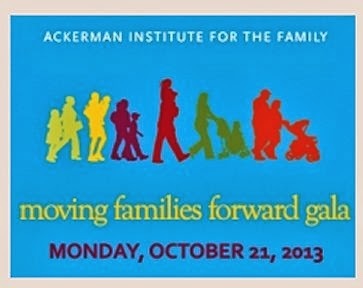 On Monday, October 21, 2013, entrepreneurs, celebrities, personalities, philanthropists and business leaders are gathering for the seventh annual Moving Families Forward Gala benefitting The Ackerman Institute for the Family. Natalie Morales, News Anchor of NBC News’ TODAY & Co-Host of the third hour, is hosting for the third consecutive year. Photo below left of Moving Families Forward gala information scanned from Ackerman.org Web site. The event, being held at NYC's spectacular Waldorf Astoria, is the most luxurious and prestigious art deco landmark in NYC. 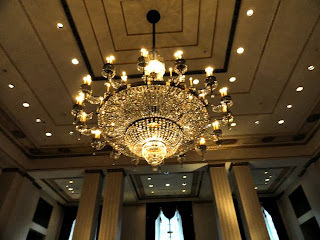 The Waldorf Astoria is recognized as a “Historic Hotel of America” by the National Trust for Historic Preservation and is also the first hotel to offer room service. Photos above left, exterior Waldorf Astoria and below right crystal chandelier adorns the dining ballroom by Gloria Buono-Daly. Moving Families Forward Gala Co-Chairs are Martha Fling and Alice Netter. 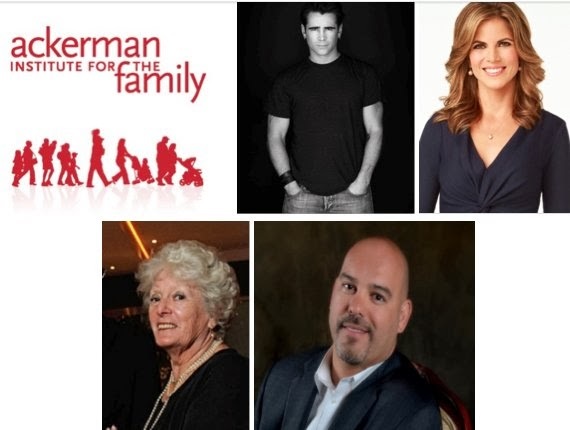 They are members of the Board of Directors of the Ackerman Institute for the Family, and staunch supporters of its work on behalf of the well-being of children and families of our communities. The entertainment for the Gala will be John Pizzarelli Quartet with Bucky Pizzarelli. The host of the auction will be C. Hugh Hildesley, Executive Vice President, Sotheby’s. 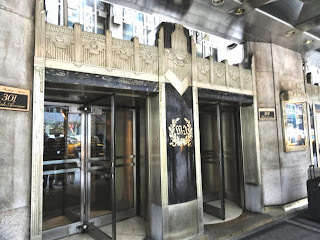 Photo below left of Ackerman's new downtown location, 936 Broadway, New York, NY taken from Ackerman News Blogspot. Since 1960, the Ackerman Institute for the Family has achieved international prominence and earned national awards for the development of innovative models of family therapy, professional training, and community programs for families facing major life challenges. One of the first training institutions in the United States committed to promoting family functioning and family mental health, Ackerman is dedicated to helping families at all stages of family life. Event photos are already posted on Facebook at the Moving Families Forward Gala benefitting The Ackerman Institute for the Family photo album. Please share and visit frequently. This article will also be updated regularly with photos and other related information. Please visit frequently and subscribe to our RSS feed. Thanks. Stay tuned for the exciting “See What You Missed” video of the event which will include special interviews from the President of Ackerman Family Institute as well as honorees and host. The Ackerman Institute for the Family is a training institute for family and couple therapy. 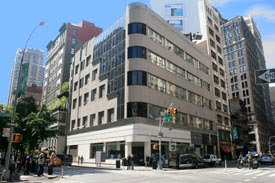 The Institute was founded in 1960, in New York City, by Nathan Ackerman, who became its first president and from whom the Institute derives its name. 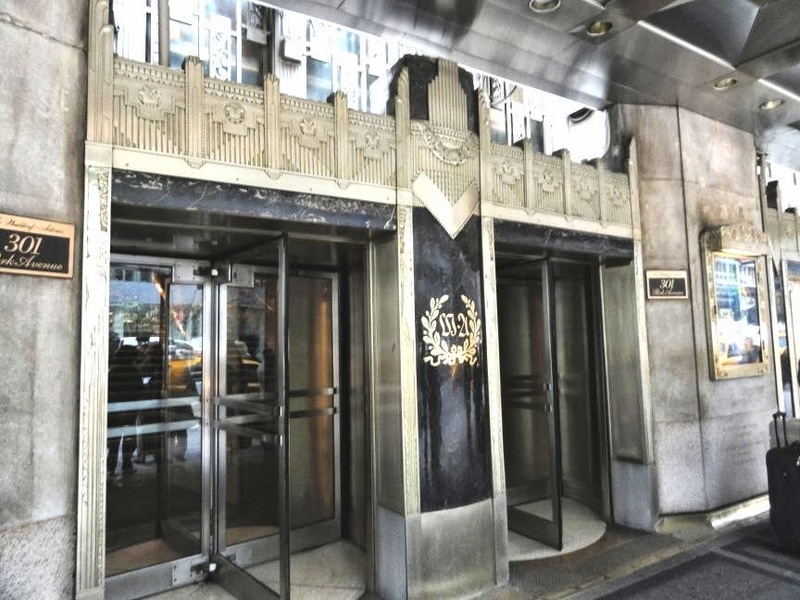 It is located at 936 Broadway, New York City. •	Couple and family therapy services through its on-site Clinic (licensed by the State of New York Office of Mental Health). •	Training programs for mental health and other professionals on-site, in community settings and internationally. •	Research initiatives that focus on the development of new treatment models and training techniques.